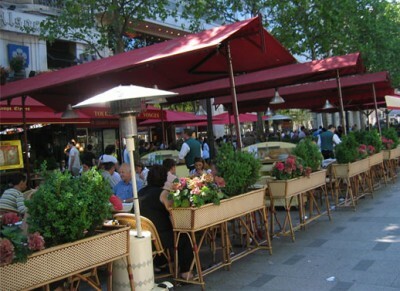 We’re all familiar with the sidewalk cafe, and they’re a key ingredient in enlivening a street. However, it’s not quite enough to create an outdoor cafe scene. Thus, if you don’t have a pedestrian street to do a outdoor cafe walk, alley or square, go for an outdoor cafe stage row. What’s the ‘stage’ component? You need a sense of destination, and a couple of tables outside a cafe doesn’t quite do it. Even a dining area two tables deep isn’t enough. It needs to be at least three tables deep (connected tables don’t count!) or 30 feet – so there’s a feeling of a stage in front of a building providing ‘event’ status. The ‘row’ element is necessary because just one of these places won’t attract people – what if the restaurant is full, then what? There needs to options, and a series of these restaurants, in a row – thus the industry term ‘restaurant row’ – helps establish a sense of destination worth going out of your way for. The easiest way to build an outdoor cafe stage row? Well, it’s easier said than done, but take one lane of traffic (which New York City has no problem doing) and dedicate that to dining. Which one do you think would contribute more to the economy… and culture? Photo of Parisian cafes by ddoug17022.